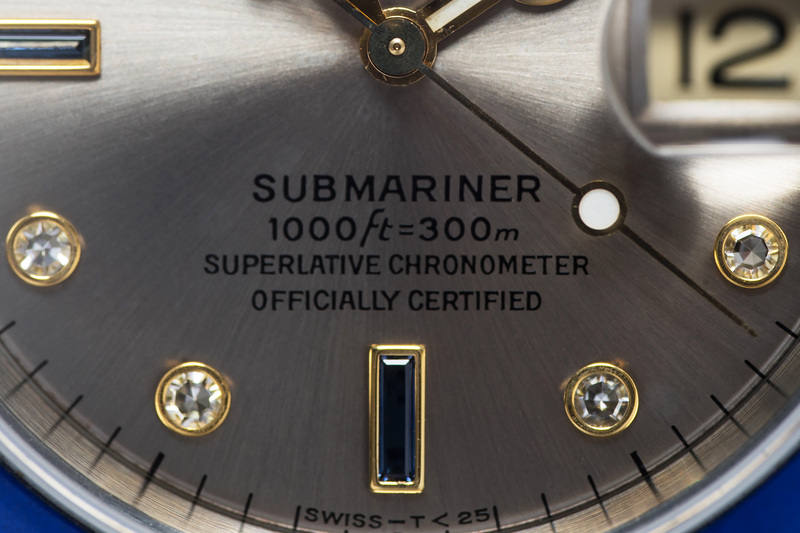 Now here’s a Submariner you don’t see everyday – Its the two-tone version and this configuration is better known as the SERTI SUB or simply known as SULTAN. The stunning slate grey dial on this Submariner is set with 8 round diamonds and 3 sapphire markers (2x baguette cut and 1x pyramid cut). 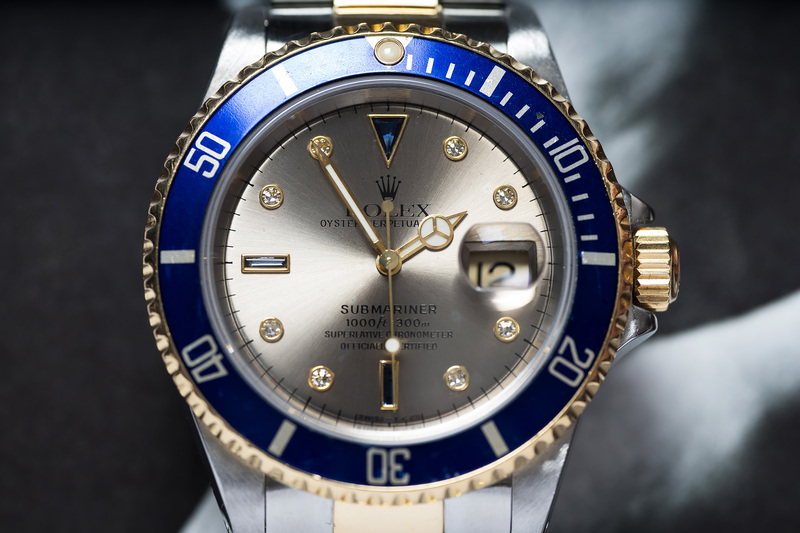 The nickname Serti is derived from the French language and means as much as “setting” In the past this word was used by Rolex for all watch-dials that we’re fitted with precious stones. Nowadays, the Serti dial like the one on our Submariner is no longer available, it is to be believed that the last Serti dial Submariners were produced in 2008, the same year the new and ceramic bezeled 116613LB Submariner was introduced to the market. 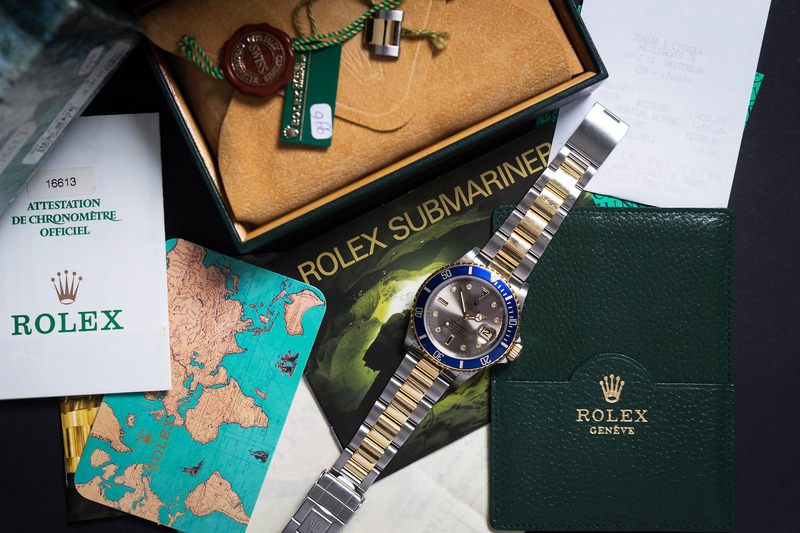 The 16613 SERTI we are offering here is a truly Full Set and a 100% Original Serti Submariner! Why? 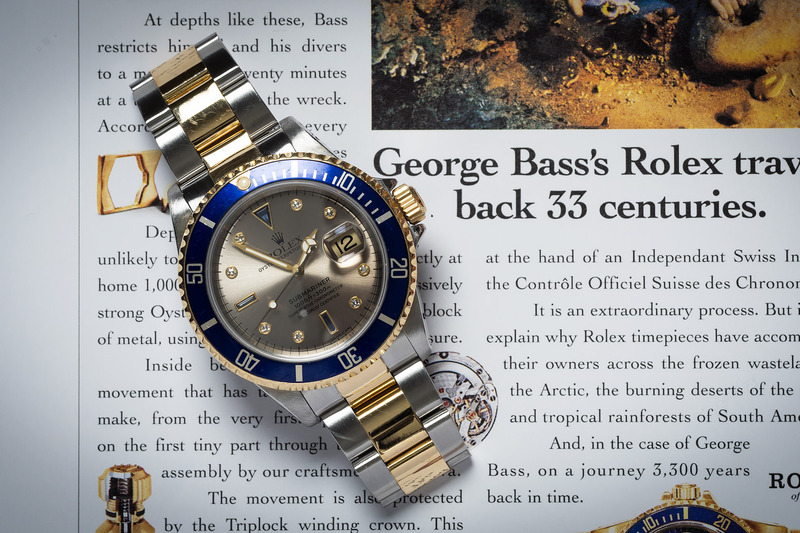 first of all, all (punched) paperwork is present, the original receipt from the first owner mentions the diamond and sapphire dial, as well as the reference and the unique case number. Furthermore, the hangtags and the outer cardboard box have the same matching numbers, reference number en case-number repeated several times! Also, on the outer cardboard box is a small round grey sticker, which refers to the slate grey dial! All booklets, calendar card and green map are also present with the watch. The 18k gold and stainless steel bracelet shows little to no stretch, the case is nice and thick and the dial is truly perfect! 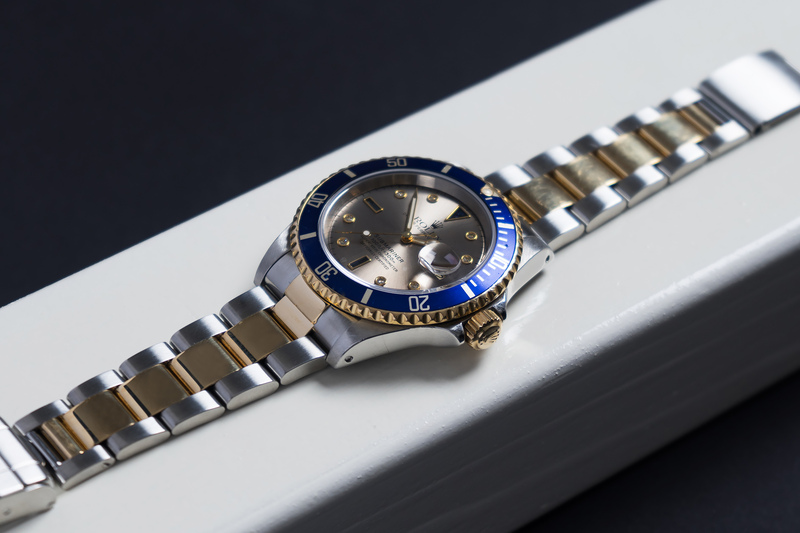 The blue insert is still the original one with its Tritium pearl fully intact and showing a slightly cream color. 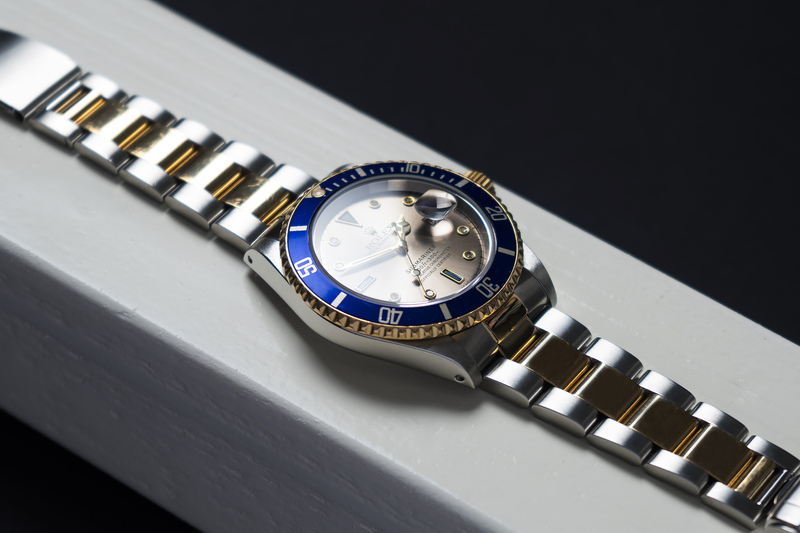 The entire watch shows us that it was worn with a lot of love and care while the serial learns us that the watch was produced in 1997 and according to the receipt and punched warranty, was sold in 1999 by one of the Dutch Rolex retailers (S&C). Now, are you ready for some diamonds and sapphires!? This SULTAN SUB is fully overhauled and waterproof tested by our watchmakers and will be delivered with a twelve month warranty. box and papers: Yes – Super Full Set!